Before I became a performance artist I was shy and introverted; I went around dressed as if I was invisible. 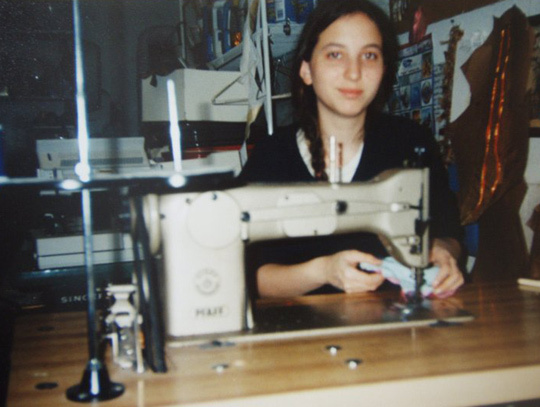 I sat behind my sewing machine or my easel and I made my art as an inner exploration, taking what was inside me, my deepest thoughts, feelings and imaginings and putting them into forms both three and two-dimensionally. Then one day I made a sculpture that couldn’t stand on its own, not literally but conceptually, so I had to re-perform its making on camera in a new context. Eventually I gained the courage to forgo the object altogether and just to present myself and my voice to the world live, without mediation and I was reborn a performance artist. This is my story as told at numerous universities where I have been invited to speak about my work since 2010. The lecture is part motivational speech, part artist talk and describes the soul-searching work I’ve done on myself to overcome my shyness and come to terms with who I am, allowing me to become the self-confident and poised performance artist I am today. I address how I moved beyond the expectations and projections of my parents; the role models I found in Carrie Bradshaw and Judy Chicago and how they helped me to progress in the face of criticism from my tutors at Goldsmiths; my new found unconditional self-acceptance which has enabled me to use my voice; and my desire to share these insights with others in my workshops and web-TV show The O Show.